The Java Array Fill Method is one of the Array Method which is used to assign user specified value to each and every element in specified range (if specified) of an array. In this article we will show you, How to fill the Boolean array, Byte Array, Object Array, Integer Array, Char Array, Long Array, Double Array, Float Array, Short Array and Object array. 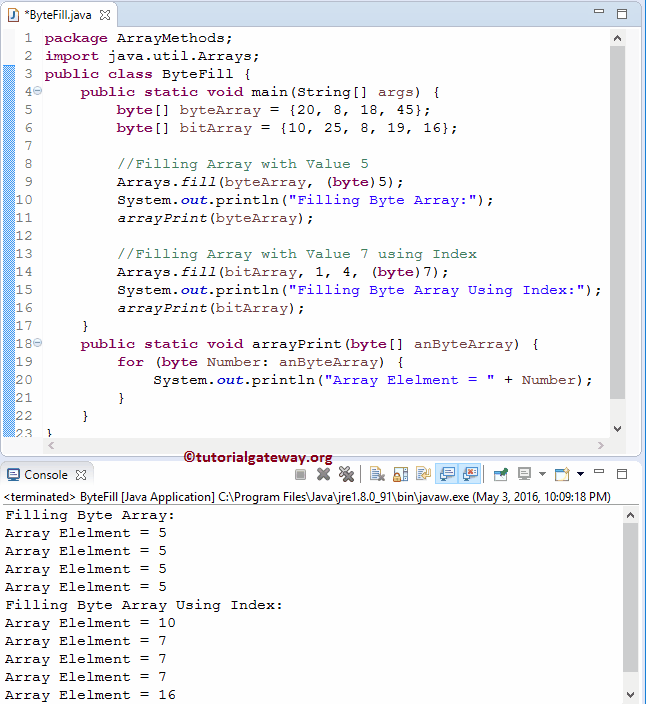 Before we get into the example, the basic syntax of the Arrays.fill in Java Programming language is as shown below. The Java Programming Language provides eighteen different methods to fill the Java Array. Following method will accept the Byte Array as the first argument, starting index position (fromIndex) where the filling will begin as the second parameter (integer value), last index position (toIndex) where the filling will end as the third argument, and byte value (array element is replaced by this value). NOTE: Java Arrays.fill method will fill the array elements starting from the fromIndex up to toIndex but not included. This Java Array Fill method will accept the Boolean Array and Boolean value as the parameter and assigns the Boolean value to each and every element in a Boolean array. Following java fill method will accept the Boolean Array as the first argument, starting index position (fromIndex) where the filling will begin as the second parameter (integer value), last index position (toIndex) where the filling will end as the third argument, and Boolean value (array element is replaced by this value). This Java Array Fill method accept the short Array and short value as the parameter and assigns the short value to each and every element in a short array. Following method will accept the Short Array as the first argument, starting index position (fromIndex) where the filling will begin as the second parameter (integer value), last index position (toIndex) where the filling will end as the third argument, and Short value (array element is replaced by this value). This Java Fill method accept the Character Array and Char value as the parameter and assigns the Character value to each and every element in a Character array. Following java array fill method will accept the Character Array as the first argument, starting index position (fromIndex) where the filling will begin as the second parameter (integer value), last index position (toIndex) where the filling will end as the third argument, and Character value (array element is replaced by this value). Following method will accept the Integer Array and Integer value as the parameter and assigns the Integer value to each and every element in a Integer array. The Java Fill method accept the Integer Array as the first argument, starting index position (fromIndex) where the filling will begin as the second parameter (integer value), last index position (toIndex) where the filling will end as the third argument, and Integer value (array element is replaced by this value). Following method will accept the Long Array and Long value as the parameter and assigns the Long value to each and every element in a Long array. Following method will accept the Long Array as the first argument, starting index position (fromIndex) where the filling will begin as the second parameter (integer value), last index position (toIndex) where the filling will end as the third argument, and Long value (array element is replaced by this value). This Java Array Fill method will accept the Double Array and Double value as the parameter and assigns the Double value to each and every element in a Double array. Following method will accept the Double Array as the first argument, starting index position (fromIndex) where the filling will begin as the second parameter (integer value), last index position (toIndex) where the filling will end as the third argument, and Double value (array element is replaced by this value). Following method will accept the Floating-point Array and Float value as the parameter and assigns the Floating-point value to each and every element in a Float array. This Java Arrays.Fill method will accept the Floating-point Array as the first argument, starting index position (fromIndex) where the filling will begin as the second parameter (integer value), last index position (toIndex) where the filling will end as the third argument, and Floating-point value (array element is replaced by this value). Following method will accept the Object Array and Object value as the parameter and assigns the Object value to each and every element in a Object array. Following method will accept the Object Array as the first argument, starting index position (fromIndex) where the filling will begin as the second parameter (integer value), last index position (toIndex) where the filling will end as the third argument, and Object value (array element is replaced by this value). fromIndex: Please specify the starting index position. This is the index position where the Filling will begin. toIndex: Please specify the end index position. Java Arrays.fill method will fill up to this index position but it will not include the element at this position (toIndex). Value: Please specify the value that you want to assign for each and every elements of an array. In this Java program we declared the byte array with random array elements, and then we will fill the Java array elements with new value. Following statement will call the public static void fill(byte anByteArray, byte Value) method to assign the Value to each and every element in a byte array. Following statement will call the public static void fill(byte anByteArray, int fromIndex, int toIndex, byte Value) method to fill the byte array from index position 1 to position 3 with value 7. In this Java program we declared the Boolean array with random array elements, and then we will fill the Java array elements with new value. Following statement will call the public static void fill(boolean anBooleanArray, Boolean Value) method to assign the Value to each and every element in a Boolean array. Following statement will call the public static void fill(boolean anBooleanArray, int fromIndex, int toIndex, Boolean Value) method to fill the Boolan array from index position 1 to position 3 with Boolean False. In this Java program we declared the Short array with random array elements, and then we will Sort the Java short array elements in Ascending Order. Following statement will call the public static void fill(short anShortArray, short Value) method to assign the Value to each and every element in a Short array. Following statement will call the public static void fill(short anShortArray, int fromIndex, int toIndex, short Value) method to fill the Short array from index position 1 to position 3 with 75. In this Java program we declared the Integer array with random array elements, and then we will fill the Java Int array elements with new value. Following statement will call the public static void fill(int anIntegerArray, int Value) method to assign the Value to each and every element in an Integer array. Following statement will call the public static void fill(int anIntegerArray, int fromIndex, int toIndex, int Value) method to fill the integer array from index position 1 to position 3 with 50. In this Java program we declared the Long array with random array elements, and then we will fill the Java Long array elements with new values. In this Java Array Fill method example, the following statement will call the public static void fill(long anLongArray, long Value) method to assign the Value to each and every element in a Long array. Following statement will call the public static void fill(long anLongArray, int fromIndex, int toIndex, long Value) method to fill the Long array from index position 1 to position 3 with value 1500. In this Java program we declared the Double array with random array elements, and then we will fill the Java Double array elements with new value. Following statement will call the public static void fill(double anDoubleArray, double Value) method to assign the Value to each and every element in double array. Following statement will call the public static void fill(double anDoubleArray, int fromIndex, int toIndex, double Value) method to sort the Double array from index position 1 to position 3 with 180.75. In this Fill Java program we declared the Float array with random array elements. Next, we will fill the Java Float array elements with new value. Following statement will call the public static void fill(float anFloatArray, float Value) method to assign the Value to each and every element in a floating-point array. Following statement will call the public static void fill(float anFloatArray, int fromIndex, int toIndex, float Value) method to fill the Float array from index position 1 to position 3 with 25.75f. In this Java array fill program we declared the Character array with random array elements, and then we will fill the Char array elements with new value. In this Java Fill method example, the following statement will call the public static void fill(char  anCharArray, char Value) method to assign the Value to each and every element in a char array. Below statement will call the public static void fill(char anCharArray, int fromIndex, int toIndex, char Value) method to fill the Char array from index position 2 to position 3 with character ‘A’. In this Java program we declared the String array with random array elements. Next, we will fill the Java string object array elements with new object value. Within this Java Array Fill Method example, the following statement will call the public static void fill(Object anObjectArray, Object Value) method to assign the Value to each and every element in an Object array. Following statement will call the public static void fill(Object anObjectArray, int fromIndex, int toIndex, Object Value) method to fill the Object array from index position 1 to position 3 with string “USA”.